The history of the daily saga from 1964 through to 2003. A more detailed look at the production, decade by decade. A collection of facts to chew over about the series. How ATV and the Crossroads programme launched the Caring for Carers charity. 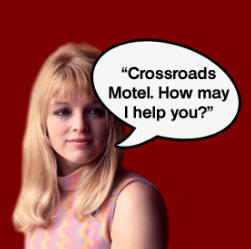 The story of the Crossroads Motel opened by Meg Richardson in 1963. The places used to record outdoor scenes by ATV and Central. Also further destinations visited. The Kings Oak Village guidebook was a trove of information about the area. A look at the viewing figures from across the original series. A look at the main characters from the saga as well as motel owners and a staff list. Crossroads was given a new lease of life thanks to Network DVD. Here’s a guide to each release. Let’s put a few things right concerning what’s been said about Crossroads over the years. Celebrating those no longer with us from the cast. A guide to merchandise releases concerning the show. Video clips from the fan club.